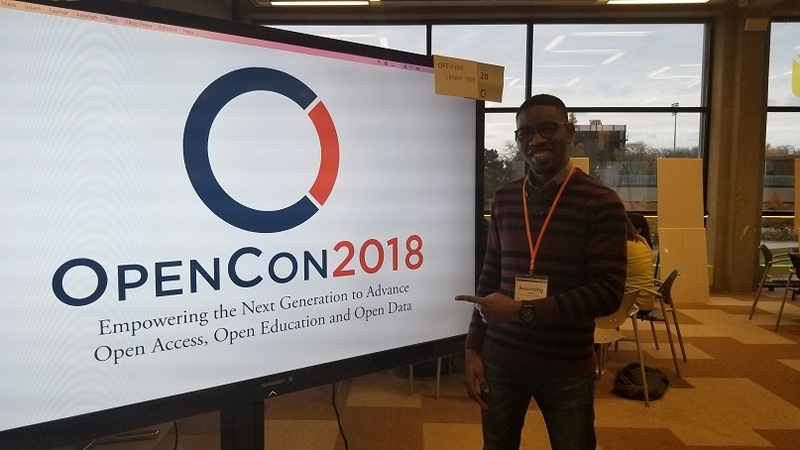 Anointing Momoh attended OpenCon 2018 in Toronto, ON, November 2-4, as the recipient of the SFU Library OpenCon 2018 travel scholarship. Anointing reports on this "enlightening" experience and the opportunity to engage in discussions around Open Access, Open Data, and Open Education. 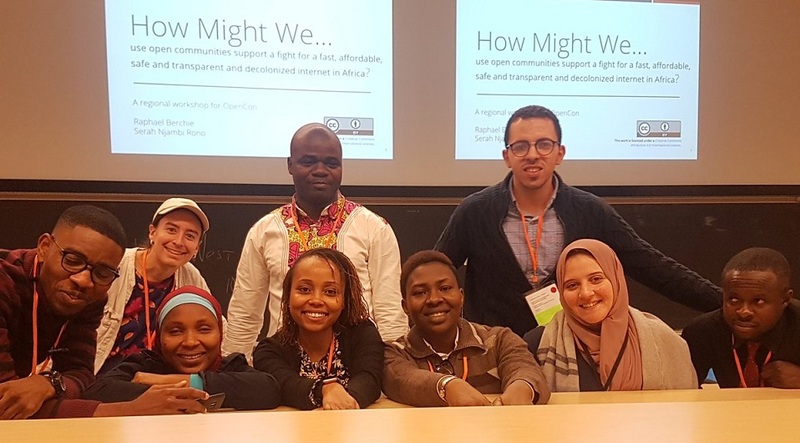 "It was exciting for me to join several early-career and experienced professionals for three days at OpenCon 2018 from November 2-4, 2018 on the campus of York University, Toronto, Ontario. Between, visiting Toronto, for the first time, and meeting several amazing people, OpenCon 2018 was enlightening, featured great conversations, and budding ideas. Over the three days, through several panels, workshop and unconference sessions, I had the privilege of interacting with Open advocates and newbies (like me) from around the world to share thoughts and ideas and come up with courses of action for promoting Open. "It was one conference in which I had to put on several hats in thinking through the issues of Open Access and how my previous experiences have drawn me towards the movement. As a Public Policy researcher, I had cause to reflect on how Open data and Open Research would lead to more effective data-driven public policies. As an African Leaders of Tomorrow Scholar, I had to think through the issues in relation to the global South - including Africa. As a student leader, I was again reminded of how for many students, having an education is a delicate balance between paying for tuition, buying expensive textbooks and meeting basic living expenses like rentals and food. Open education resources including Open textbooks could easily be revolutionary. "In my opinion, one major strength of the Open movement is the rich and diverse community which it brings together as well as the iterative approach that it has come to adopt it addressing Openness issues. For me, this made the opening panel session on Community as Foundation for Culture Change a fitting starting point for OpenCon 2018. The panellists shared their thoughts on the place of community in the Open movement. Juan Pablo facilitated this session and was quick to point out two ways to look at “community” in the context of Openness. First as an avenue to identify a problem and thereafter the solution, and secondly as a source of help and support for ideas and projects. Stacy Allison-Cassin talked about the work she is doing to support the development and use of open vocabularies with and for Indigenous communities in Canada, to promote community participation and control as well as indigenous data sovereignty. Erzsébet Tóth-Czifra talked about ‘pushing the boundaries of OpenScience towards Open Scholarship’. Abdullah Alghurabi shared with us the interesting work he and his team are doing and the successes they have recorded through ‘Education Yemen’ to make educational resources and scholarship information available to students without internet in war-torn Yemen. "For me, an important thread that ran through all the presentations was the fact that ‘Open’ is what it is because of the community and networks of individuals not limited by geography or colour but who are always there to help break the barriers to making knowledge available. Thomas Hervé Mboa Nkoudou summed it up in his presentation on Open Access in Africa, using the Swahili word ‘Ujamaa’ which speaks to a sense of family. There are always people who want to help and as an OpenCon Alum who will be putting ideas forward and developing projects, I realize I need to keep a critical eye to identify them. "I was privileged to be assigned to a workshop session on focused on Open Access in Africa. The Open Access movement has made some progress in the past few years in the move towards the democratization of knowledge in its various forms. There is more ground to cover regardless and with this progress comes the unveiling of a number of germane aspects that need to be thought through carefully. One of such is the assumption of internet access as ‘a given’. For many in Africa, the internet is hugely expensive. The quality and reach of internet service are also unreliable. In several parts, the internet is literally non-existent. In far-flung poverty-ridden rural areas across Africa (urban areas as well), education is the only way out for many and currently available Open Education resources on the internet would be of immense benefit. To the extent that there are Open resources available elsewhere that can facilitate education, which are not readily available due to the internet and other structural constraints, one could argue that Open Access is not so open in Africa. With this context, a logical first step for gaining the most momentum for the movement in Africa is addressing the several concerns and constraints with internet access across the continent. For Africa, Open Access means significantly more than the democratization of knowledge. It begins with facilitating and opening access to Open Access; especially through a fast, affordable, safe and transparent and decolonized internet in Africa. "An interesting question that came out of this workshop session was “How can the Open community help transform academic discussions of cognitive Justice into action by re-envisioning ways that money and resources flow from the "global north" to the "global south" and by advocating policy changes?”. We identified the need for the more developed Open Communities in North America and Europe to advocate for the redirection of funding that typically goes to western NGO's & non-profits to local educators and groups in Africa. "As a graduate student interested in publishing my research, attending an OpenCon Unconference session on Publishing with Open Access Journals was a no-brainer. I felt it would be interesting knowing the various opportunities for Open Access publishing and how I can be better aligned to take advantage of them. A major highlight of this unconference session was understanding the Open Access publishing framework. Open Access journals are too often misconstrued for predatory journals. Questions are raised about journal impact factors of OA journals, the peer-reviews and other quality assurance processes. It appears that much of the misinformation is passed on from faculty to student - perhaps innocently. There seems to be an implicit assumption that Open translates to low quality. However, the innovations within the Open Access movement including innovative funding models for Open Access journal publishing allows the Directory of Open Access Journals (DOAJ) to curate an increasing number of high quality, peer-reviewed journals. Openness and high-quality research are not mutually exclusive! "Looking forward, I intend to leverage on the knowledge and the networks which I have formed during OpenCon to engage with graduate students here at SFU to debunk some of the misconceptions about Open Access publishing. Also as one of the few Africans on the ground at OpenCon 2018, I intend to continue collaborating with my colleagues on how we can engage the community to increase the knowledge of and access to currently available Open Access resources and platforms across Africa."